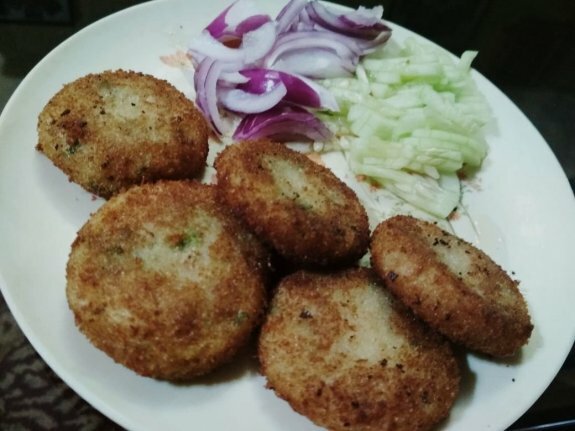 Poha Cutlet is definitely the best recipe with an addictive and tempting tea time snack. This is one of the easy to make recipe which is healthy yet tasty and can easily made at home. 1. Take a big bowl and add 1 cup washed poha and 2 boiled and mashed potatoes. 2. Now, add turmeric powder, red chili powder, aamchur, garam masala powder, ginger garlic paste, Chaat Masala and black pepper powder. Now, add corn flour, salt and coriander leaves as well. 3. Combine everything well to make a smooth form of dough. 4. Take a small sized ball from the dough to make a patty after greasing oil in the hand. 5. Now dip in plain flour and Corn flour batter and coat the patties with breadcrumbs on all sides. 6. Do the same process and make all the rest of the patties. 7. Now heat oil in a pan and shallow fry or pan fry or deep fry as per your choice. But it is suggested to fry on medium flame until both sides turns light golden brown. Remove from oil and place it in a kitchen towel to soak excess oil. Your Poha Cutlet is ready. Serve it with Mint Chutney or Tomato Sauce.